For visitor information, go to Walton Lighthouse on Facebook. The lighthouse is a wooden structure, 15 feet square at the base and 20 feet in height to the floor on the top deck, upon which the lantern sits. The lantern is 8 feet in height, containing the light, elevated 60 feet above high water. The walls of the interior on the lower floor are finished with plaster, on the second floor the walls are sheathed with wood. The present lighthouse was built in 1873 by Timothy Parker, at a cost of $620.00. It is the only surviving lighthouse in Hants County. It was once the brightest lighthouse on the upper Bay of Fundy, guiding seagoing ships into the port of Walton. Here they loaded cargoes of pulpwood, gypsum and barite before setting out for ports along the eastern seaboard of the United States. The light apparatus consisted of two large flat wick lamps with a brass base, using kerosene oil. The light was magnified by a Fresnel lens with a 16" reflector. A black screen revolved around the outside of the lamp so that the light was visible 10 seconds; dark 3 seconds; visible 4 seconds; dark 3 seconds (occulting), through a repeating cycle. The screen was operated by a clock mechanism, that had to be hand wound each night by cranking a handle for about 60 turns. Kerosene oil for the lighthouse came in 45 gallon drums, and were lightered ashore by the ship's launch to the breakwater, from the Coast Guard ship, S.S. Dollard, which anchored a few miles offshore. In later years the SS Dollard was replaced by the CCGS Thomas Carleton, to serve the Bay of Fundy and the Minas Basin. In later years the lighthouse was converted to an automatic system, with an electronic flasher installed giving light 3 seconds; dark 4 seconds; light 7 seconds, then repeating itself. After the decline of shipping in the late 1970's from the port of Walton, the lighthouse was decommissioned. The lighthouse was declared surplus by the Department of Transport, and was put up for sale by tender. 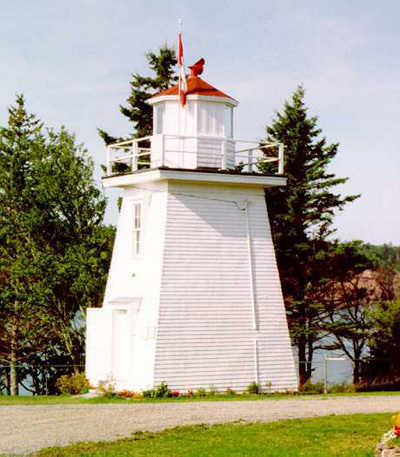 The Municipality of East Hants bought the lighthouse in 1991 for its heritage property. The lighthouse was designated as heritage status on August 12, 1992. 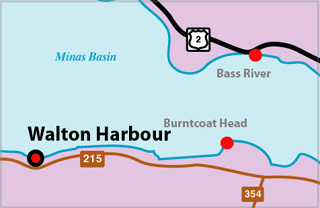 Today, the lighthouse is maintained by the East-Hants Tourism Association. It has become an important tourist attraction along the Hants Shore.